Firefox, and several other browsers, have a second text entry field in the address bar (at the top of the browser window) where you can type in what you're looking for, and send that to a search engine automatically, rather than having to visit the search engine's main page first. For example, you can type a word into this field and automatically do a Google search on that word without having to visit Google's home page first. Most search engines have "search plug-ins", which are just little XML files that teach your browser how to send proper queries to that search engine. If you know the standard for these XML files, it's very simple to write your own. The XML format is documented at opensearch.org, and the Firefox developers have also written a more concise page with an example of an XML file, just waiting to be customized. When you click on the icon for the currently selected search engine (in these images, Google) you will get a list of the search engines you have installed, and there will be a selection to add the plug-in available through the page. When you select the option to add the plug-in, it will be installed in your browser and activated. 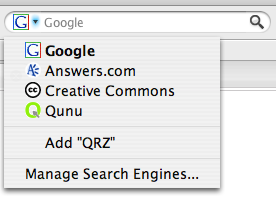 You should see the icon for the new search engine. Now when you look at the menu, you will see the new "search engine" on the list. You can now do searches using that "search engine" by typing what you're looking for in the search box and hitting ENTER. 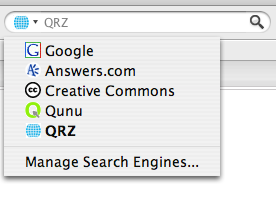 In this case, you can enter a call sign and it will show you the QRZ page for that call sign. There are two parts of it- an XML file containing the parameters that your browser needs in order to build a query for the "search engine", and an HTML <link> tag in the <head> section of each web page from which the plug-in may be installed. 2009-10-06 I got an email from David Levine, K2DSL, letting me know that QRZ.com had changed the format of the request to look up a call sign. I have updated this page, as well as the qrz.xml file, to use the correct format. Thanks for letting me know about this. If you're curious, this page on qrz.com explains how the lookups are supposed to be done, and the fact that any other methods which may have worked in the past are no longer guaranteed to work. Everybody who uses QRZ's web site to look up call signs should be using the correct format. Either that, or pay for an XML subscription and be allowed to send queries directly to their database.